This hummus recipe switches up that plain boring hummus with this tasty roasted red pepper version. lately, and one of the things I have been trying to cut back on is sandwiches. Luckily I have had tons of fresh veggies between my garden and a friends. I have tomatoes, and she has cucumbers, radishes, lettuce......you know, all the stuff I should be eating. But salads only work so much for me. I am a sammie kind of girl. I grew up on them. My Mom used to pack bologna and Miracle Whip sandwiches for my lunches. Talk about the unholy trinity!! White bread + fat packed tube meat + sugar filled sandwich spread. I still get cravings for those! It is kind of like the good ol' mac & cheese in the blue box. You know it is so bad for you, but sometimes that little voice in your head says GIMME!! So I decided to try to put together things that I love as well as things that are good for me. One of my favorite things lately, that doesn't give me any guilt, is hummus. 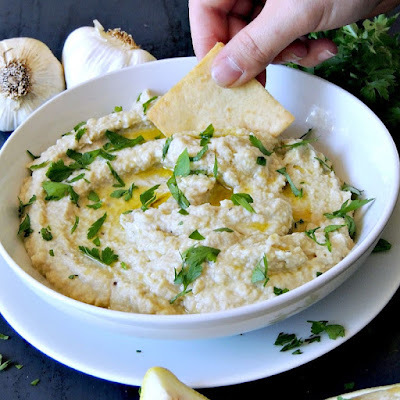 I have a couple types here on the blog (Roasted Garlic White Bean Dip and Avocado Hummus AKA Guacammus), but my taste buds have been wanting to switch it up. I used to love a store bought brand that had roasted red peppers in it so I decided to make my own. I mean we know that is cheaper right? Plus I like the fact that I know exactly what is going into it. Hummus is seriously one of the easiest things you could ever make. Drop a bunch of yuminess into your food processor and zippppppppppppity it is a fabulous bowl of creamy goodness. The thing that is super awesome about hummus is that you can sub it for mayo on a sandwich. Which is awesome because that means I don't have to give up my craving for creaminess on my sandwich plus I get extra protein to boot. That my friends is a win/win! However, if you want to get any of this to a sandwich, you might want to make a double batch! It is so full of flavor that it was all I could do not to sit down with the entire bag of pita chips and hummus and go to town! Now I can't wait to make a bazillion other flavors of hummus. to shove in my face use in healthy wraps! 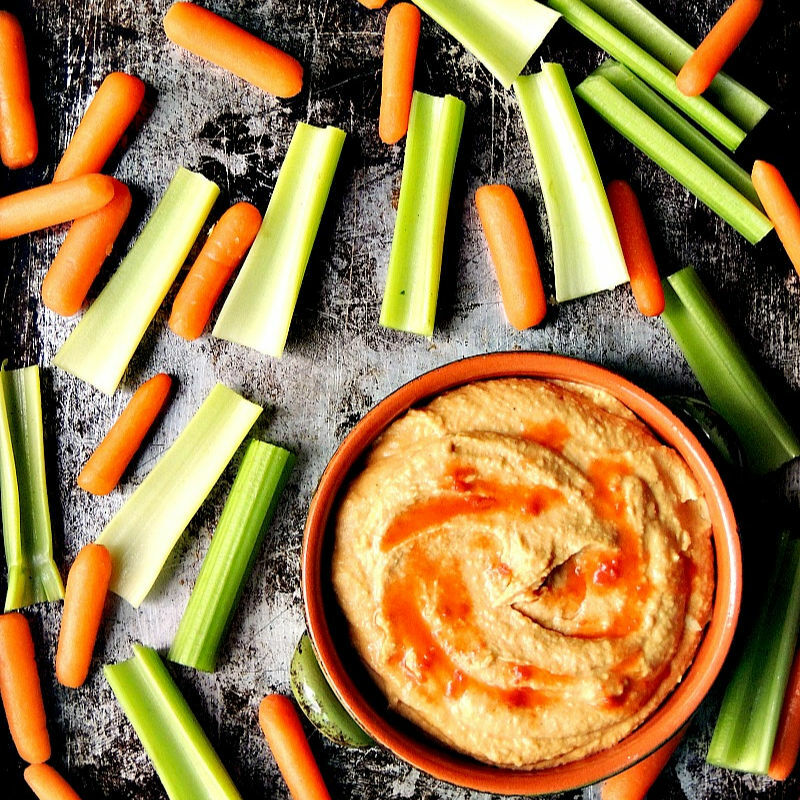 Do you have a favorite flavor of hummus? How about a healthy way to get a sandwich fix? 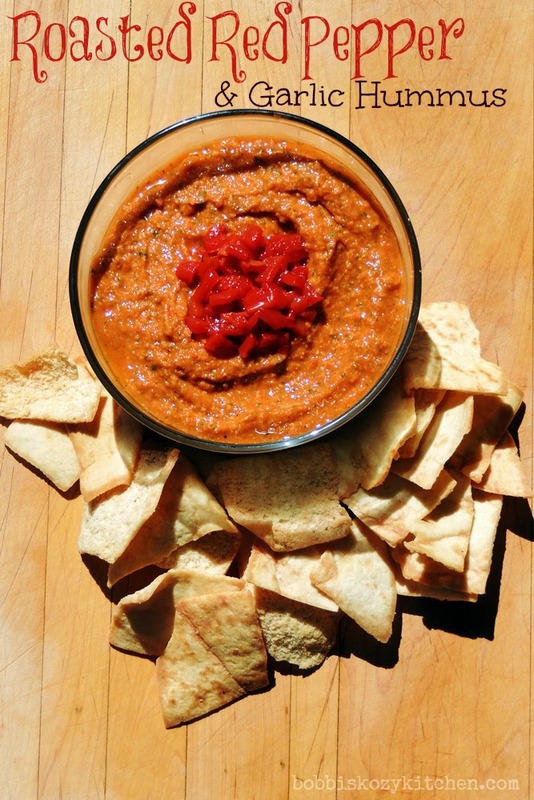 Switch up that plain old boring hummus with the tasty roasted red pepper version. Place drained roasted red peppers in a clean kitchen towel and twist to remove as much liquid as possible. 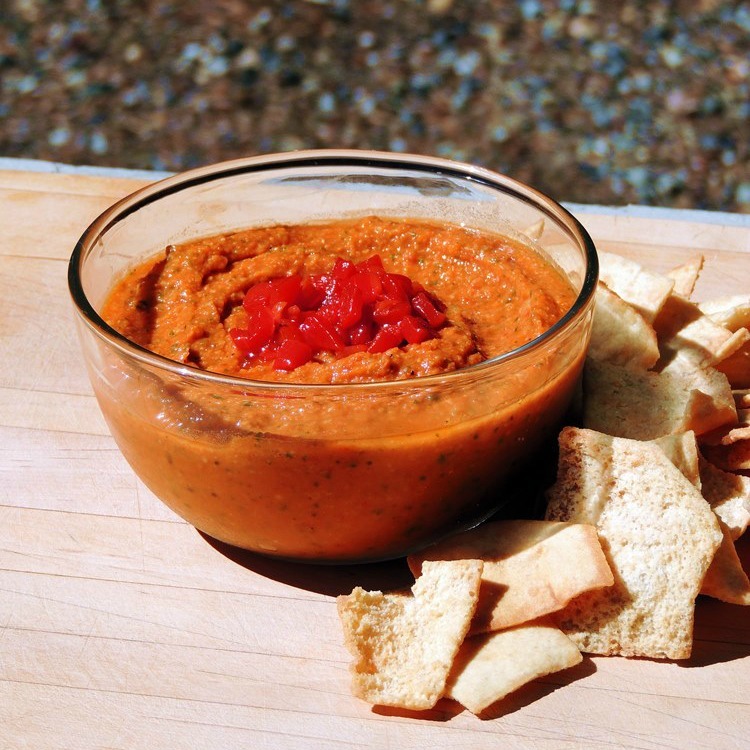 Mix all of the ingredients, except the olive oil and pita chips, in a food processor until pureed. Then slowly stream in the olive oil until the desired constancy. Cover and refrigerate for at least 1 hour prior to serving to allow the flavors to meld. Serve with pita chips or veggie stick. You know, the funny thing is that I would almost choose hummus over dessert--heck, I totally would! Especially with this awesome power combo you've dreamed up here. Lovin' it--cheerios to you, and a very happy weekend! !